For fighter info, see Wii Fit Trainer (SSB4) and Wii Fit Trainer (SSBU). 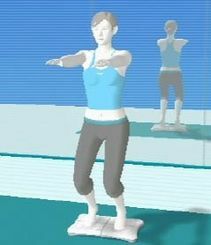 The Wii Fit Trainer, as they appear in Wii Fit Plus. The Wii Fit Trainer (Wii Fit トレーナー, Wii Fit Trainer) is a role in the Wii Fit series filled by a female or male fitness instructor. Image of the Female Trainer in Wii Fit U. In the Wii Fit games, the Wii Fit Trainers instruct the player during fitness exercises (typically those involving mimicking yoga poses) by posing in a way that the player then has to mimic, and instructing them on what to do. The Wii Fit Trainers also offer the player encouragement and advice. Wii Fit Trainer (female) as she appears in Super Smash Bros. 4. The female Wii Fit Trainer was confirmed as a playable newcomer in Super Smash Bros. 4 on June 11th, 2013, during E3 2013, with her own trailer being shown. On the current SSB4 tier list, Wii Fit Trainer is at 51st place out of 55, ranking at the bottom of the F tier. Her quick mobility grants her a good approach, along with decent combo ability. She also comes equipped with two useful projectiles in Sun Salutation and Header, with the former capable of healing her, and the latter being useful for edge-guard breaking and even being able to score a meteor smash. Her Deep Breathing special can temporarily power her up, making her KO options even more powerful. However, her attacks possess noticeable start-up lag and problematic hitbox placement, making successful hits difficult without careful planning. Her grab game is also an issue, with barely any reach on it, and underwhelming throws. All in all, Wii Fit Trainer's issues make her one of the most obscure characters in competitive play, evident by her low tournament representation; however, she still has a few dedicated players that play her as a solo main, such as John Numbers. A simple yoga pose that is known to better your balance and posture, all it requires is standing on one leg and stretching your arms upward. Squatting low and then extending the arms will protect the Wii Fit Trainer from damage for a time and also increase the power of your yoga blows! Stand up straight on one leg with your arms above your head. 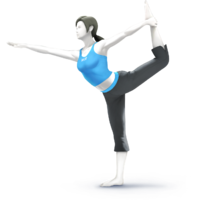 This popular yoga pose works on balance and posture, and the Wii Fit Trainer uses it to great effect as an upward smash. Not only does it give temporary invincibility, but it also makes upward launching that much more powerful. Stand on your right leg and extend your right hand, all while grabbing your raised left leg with your left hand. Arch your back like a bow to correct your posture. This is the Wii Fit Trainer's forward tilt attack, sending rear opponents flying upward and those in front flying forward. Work on your dancer pose by standing on your right leg and, while stretching your right arm forwards, taking your raised left foor in your left hand. Not only can this improve the alignment of your spine and straighten out a hunched back, but it can also help you launch opponents sideways. 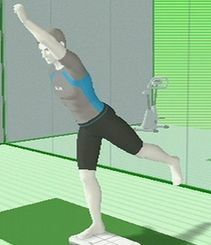 The Wii Fit Trainer assumes a forward lunge, extending one arm forward and one back at shoulder level. This pose builds powerful thigh muscles and realigns the hips. With a devastating, strong forward smash, the Wii Fit Trainer can send opponents flying in both directions! To do the warrior pose, stand with your feet far apart, turn your left foot outwards, raise your arms, and then bend your left knee. Practising this stance energises your whole body and strengthens the thigh muscles, allowing for powerful side smash attacks that launch opponents in both directions at once. A yoga pose where you lie supine on the floor, lifting your hips while keeping your shoulders and arms flat. This pose helps to strengthen your whole torso. The Wii Fit Trainer can perform this as a down tilt attack, using the knees to strike at opponents and send them flying. Lie on your back with your knees raised. Plant your hands and shoulders firmly on the floor, then lift your hips until your knees are over your ankles. This strengthens the entire torso, and you can also use it as a ground-based attack where you strike your opponent with your knees. First, kneel on your right knee while raising your right arm above your head. Then extend your left arm and leg out to the left and lean in that direction. This pose will strengthen the abdomen and tighten the waist. The Wii Fit Trainer strikes both above and forward with this move, but it takes a while to recover from. Rest on your right knee and raise your right arm as you stretch your left arm and leg out to the side. Then lean your body towards your left leg. The Wii Fit Trainer's dash attack demonstrates how to relax tense muscles, tighten your waist and strike your opponent - all at the same time. Lie flat on your back and raise your arms and legs to form a V. This exercise is more challenging than a regular sit-up, but it's great for maintaining flexibility and working the abdominal muscles. The Wii Fit Trainer uses this pose to attack in the air, hitting opponents twice before launching them upward. Lie flat on your back and, using only your abs, raise your upper and lower body until you make a V shape. This exercise is very effective at working abdominal muscles, and is especially good for powerful mid-air double-attacks that send opponents flying. Starting from a crouched position, extend one leg back and the opposite arm forward, and hold. This is a strength exercise that firms up the abdominal and back muscles nicely. It's also the Wii Fit Trainer's down smash. Combine it with a lunge attack to send an opponent sailing sideways. Start on your hands and knees, then lift one arm and the opposite leg off the ground, and hold the position to train both your abdominal and back muscles. This exercise doubles up as one of the Wii Fit Trainer's down smashes, which can launch an immobilised opponent sideways. In this aerobic exercise, you sway your hips to keep the hoops from hitting the ground. Multiple hoops ups the challenge! This exercise is a good workout and helps align the pelvis. The Wii Fit Trainer can recover well with this up special attack, but it doesn't do much to foes. This aerobic exercise from Wii Fit requires coordinated hip-movement to keep the hoop around your waist while two Mii characters throw extra hoops for you to catch mid-hula! It's also one of the Wii Fit Trainer's up special moves in this game. It's better at boosting jumps than it is at launching opponents off the screen. The Wii Fit Trainer has the most impressive balancing skills we ever seen! Many people probably started yoga to achieve this perfection. However, these abilities aren't developed overnight; it takes lots and lots of yoga practice. We won't judge if you'd rather take it easy—we aren't exactly writing this from the gym. There's just something about your Wii Fit trainer that you can't help but look up to. Maybe it's the soothing voice, the graceful motions...or just the complete physical superiority over the rest of us. Doesn't it make you want to break out a yoga mat? ...No? Well, we won't judge you. We're not sitting in a gym typing this, after all. Wii Fit Trainer (female) as she appears in Super Smash Bros. Ultimate. Wii Fit Trainer returns alongside the entire playable cast of the series in Super Smash Bros. Ultimate. Like most characters in Ultimate, Wii Fit Trainer is an unlockable character. Like in the previous game, both male and female versions of the character exist, and the female is once again the default. Her design is mostly the same except for her eyes, which have more defined pupils; Masahiro Sakurai stated during the E3 2018 Nintendo Direct that he was hesitant to make this change, but decided to do so because it was requested by the developers of Wii Fit. Wii Fit Trainer (male) as he appears in Super Smash Bros. 4. Wii Fit Trainer (male) as he appears in Super Smash Bros. Ultimate. The Wii Fit Trainer, the dog from Duck Hunt, Ridley, Dark Samus, Piranha Plant, and Palutena are the only playable characters in the Super Smash Bros. series that do not have a playable appearance in any other video game. Wii Fit Trainer, counting both variations, has been voiced by more voice actors in Smash than any other characters, with a total of 17 across six languages. Despite this, the reveal trailer for Wii Fit Trainer only uses two: Japanese and American English. This also makes Wii Fit Trainer the only character in the Super Smash Bros. series, both genders, to have different voice actors for American and European English. This is the same case for Spanish. In French, the male Wii Fit Trainer has two voice actors. One is for his grunting sounds for while attacking and getting hit. The other is for his background dialogue, taunts, and victory poses. In some languages, Wii Fit Trainer has two different names to refer to the female and male versions. Villager also shares this trait. Wii Fit Trainer and Inkling are the only characters with male and female alternate costumes where the female costume is the default. Wii Fit Trainer, Dark Samus, and Bayonetta are the only characters to have never appeared on a handheld console outside of Smash. This page was last edited on April 17, 2019, at 18:44.